↑ "Press Releases Detail - The President of India". http://presidentofindia.nic.in/press-release-detail.htm?2993. ↑ 5.0 5.1 "Governor of Bihar". http://governor.bih.nic.in/Governor.htm. ↑ "Who Is Ram Nath Kovind, Likely To Be Next President". NDTV.com. http://www.ndtv.com/india-news/presidential-election-2017-who-is-ram-nath-kovind-likely-to-be-next-president-1714149?pfrom=home-lateststories. ↑ PTI (2017-06-19). "Ram Nath Kovind: A crusader for the rights of weaker sections". The Economic Times. http://economictimes.indiatimes.com/news/politics-and-nation/ram-nath-kovind-a-crusader-for-the-rights-of-weaker-sections/articleshow/59218717.cms. ↑ 8.0 8.1 8.2 "Bihar governor Ram Nath Kovind: 10 facts about NDA's Presidential nominee - Times of India". The Times of India. http://timesofindia.indiatimes.com/india/bihar-governor-ram-nath-kovind-10-facts-about-ndas-presidential-nominee/articleshow/59216836.cms. ↑ PTI (19 June 2017). "What you should know about BJP's presidential candidate Ram Nath Kovind". Archived from the original on 18 July 2017. https://archive.is/20170718010346/http://economictimes.indiatimes.com/news/politics-and-nation/know-about-bjps-presidential-candidate-ram-nath-kovind-in-10-points/articleshow/59217524.cms. ↑ 10.0 10.1 10.2 "Ram Nath Kovind, a lawyer who cracked civils but lost 2 elections - Times of India". The Times of India. Archived from the original on 18 July 2017. https://archive.is/20170718010835/http://timesofindia.indiatimes.com/india/ram-nath-kovind-a-lawyer-who-cracked-civils-but-lost-2-elections/articleshow/59226467.cms. ↑ "Enact tougher laws to prevent crimes against dalits". The Hindu. http://hindu.com/2003/01/19/stories/2003011901650400.htm. ↑ PTI (8 August 2015). "Ram Nath Kovind, Acharya Dev Vrat appointed as Bihar and Himachal Pradesh governors". http://economictimes.indiatimes.com/news/politics-and-nation/ram-nath-kovind-acharya-dev-vrat-appointed-as-bihar-and-himachal-pradesh-governors/articleshow/48402785.cms. ↑ "36th Governor of Bihar" (en-IN ভাষাত). indiatoday. 2015-08-16. http://indiatoday.intoday.in/story/ram-nath-kovind-sworn-in-as-new-governor-of-bihar/1/458947.html. ↑ "Resignation as Governor of Bihar" (en-IN ভাষাত). firstpost. 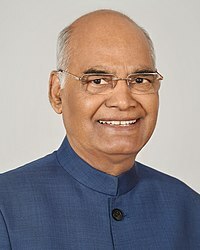 2015-08-20. http://www.firstpost.com/india/presidential-election-2017-ram-nath-kovind-resigns-as-bihar-guv-keshari-nath-tripathi-takes-charge-3723635.html. ↑ "Ram Nath Kovind is the 14th President of India" (en ভাষাত). The Hindu. http://www.thehindu.com/news/national/nda-candidate-ram-nath-kovind-is-the-14th-president-of-india/article19316904.ece. ↑ "With 65 percent votes, Kovind sweeps elections". Times of India. 21 July 2017. http://timesofindia.indiatimes.com/india/with-65-65-percent-of-votes-nda-candidate-ram-nath-kovind-sweeps-presidential-poll/articleshow/59682784.cms. ↑ "Kovind first President from Sangh, cross-voting boosts margin". Times of India. Jul 21, 2017. http://m.timesofindia.com/india/kovind-first-president-from-sangh-cross-voting-boosts-margin/amp_articleshow/59691040.cms। আহৰণ কৰা হৈছে: 23 July 2017. ↑ Sunil Prabhu (July 21, 2017). "In Defeat, Opposition's Meira Kumar Breaks 50-Year-Old Record". NDTV. http://www.ndtv.com/india-news/in-defeat-too-oppositions-meira-kumar-breaks-50-year-old-record-1727452। আহৰণ কৰা হৈছে: 23 July 2017.